It was during the Spring of long ago 1977 that, in the hunt for interviewees to be a part of The Pig Paper 's gala Kinks Kommemorative Issue, my photog and co-publisher Johnny Pig (nee Pinto) recalled an encounter several months earlier at an Ontario College of Art concert. There he had met and taken part in a fascinating discussion with an intense young man named Edgar Breau, who as that evening ended offered a gracious invitation to continue ruminating upon all things pop(ular culture) any old time we felt like visiting his home turf in Canada's most musical of all cities, Hamilton. John had been particularly struck by Edgar's remarkably keen insights into Raymond Douglas Davies, so we arranged to talk with him further on this very subject when it came time to compile our Kinks Paper. Consequently, no sooner had Government of Ontario Transit deposited us at the Hamilton Bus Terminal that, as per Edgar's explicit instructions, we found ourselves following the railroad tracks crosstown to the only house still standing on Ferguson Avenue South. Therein we duly took our seats at the kitchen table, only to become suddenly overwhelmed by the sound of a band rehearsing in the basement directly below. Yet no more than a handful of bars had passed before we realized this was a band making sounds we had never quite heard anywhere ever before: An incongruously seamless blend of Modern Lovers, Stooges-meet-Syd Barrett, Reg Presley, ELVIS Presley, Can, Pink Fairies, Hawkwind, Sun Ra even, and of course those aforementioned Kinks to boot. 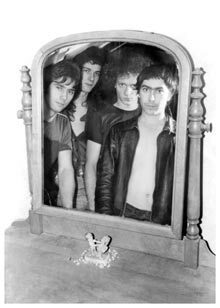 Now remember, this was still very early 1977, and those initial Blondie and Ramones long-players -- to say nothing of Metal Machine Music-- had just barely crept into only the most discriminating of Canadian record racks. Which made what we were hearing that afternoon in Hamilton all the more disarming and, courtesy of 21st Century retrospection, most utterly visionary as well. After a half hour or so the nice noise abruptly stopped, then four sweat-soaked miscreants emerged from the depths to join us 'round the Formica. There was Edgar, John whooped in instant recognition, along with fellow guitarist Alex Pollington, a Beatle-browed bassist named Kevin Christoff, and a Neal Smith sound-and-even-look-alike drummist name of Don Cramer. 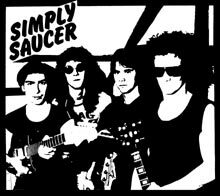 aka Simply Saucer, circa 1977. As planned, we spent the remainder of that fateful day talking Kinks with Edgar (when not talking Revolver with Kevin that is), but traveled back home afterwards with a wholly other plot developing: Trying to talk some of our Toronto friends into giving this incredible band a gig or three. Fortunately for us, but as it turned out kinda unfortunately for Edgar & Co., the subculture du jour known as Punk was just beginning to rear its razored head; therefore it wasn't that difficult at all to slip Simply Saucer onto very-late-night bills alongside the likes of various Viletones and even fellow Hamiltonians Teenage Head. In fact, when my own brave combo The Loved Ones rented a YWCA to play with Saucer one gloriously Labatts-soaked eve, OUR guitarist (ex- T. Header Steve "Sparky" Parks) soon ended up strumming instead within Edgar's motley fold, replacing the strategically fleeing Mr. Pollington. Then very soon after that precipitous turn of events The Pig Paper found itself somehow permuting directly into our very next limited legal partnership, Pig Records. First signing? Need you even ask?? Now by now Edgar and I had talked often and at length on how his band didn't really fit in with what was already becoming, by 1978, a dangerously fashion 'n' fad-conscious music scene (indeed, the dreaded milquetoast terminology "New Wave" was already being recklessly tossed about to describe any band which didn't subserviently subscribe to the A.O.R. M.O.) As a result, from the absolute dozens of delightfully disparate numbers within the Breau songbook, we decided upon the two most Pop of the bunch with which to launch not only Simply Saucer's "official" recording career, but our wee li'l label too. Hence "She's A Dog" (a fervent fave at most every live Saucershow) and "I Can Change My Mind," the latter ever-so-subtly hinting at the utter raucousness and roll with which we planned to fill subsequent singles and then eventually an entire SS LP by decade's end. I so vividly recall recording these two raw gems in one single evening inside a white bungalow-slash-recording emporium known as JB Sound somewhere atop the Hamilton mountain (the only other local studio, none other than Daniel Lanois' Grant Avenue facility, being well out of financial reach). Needless to say, as feared our proud homeowner/audio engineer of the moment, one John Boyd, instantly became so, um, non-plussed with our Pistols-as-opposed-to-Eagles approach to the finer sonic arts that he suddenly leapt up from behind the board, barged back upstairs to "Hockey Night In Canada" (leaving only his college intern beside me to somehow complete the session), and ordered us to just leave the damn money by the back door on our way out, thankyezverymuch. That's how I became a Record Producer, I think (eg: by the time we got to the B-side I'd finally discovered the bass fader --which explains why Kevin can barely be heard on "She's A Dog"; if I haven't already apologized for this unavoidable error, Mr. Christoff, I most certainly do now). Quarter-inch tape of our lightning endeavor firmly in hand by the midnight hour, all that remained was to throw ourselves a charity corn roast, I kid you not, even higher up Hamilton Mountain that Saturday, which handily paid to immediately press a thousand copies of Pig Record Number 1. I then set to work in my parents' rec room armed with scissors, Sharpies, envelopes and mailing labels aplenty. Perhaps you can then imagine our common disbelief and sheer joy when, within mere weeks of its 6 / 78 release, this seven-inch labor of true semi-monophonic love actually rated as Single Of The Week upon the hallowed pages of the Record Mirror of London. You BET we were all shocked. And stunned. Then what happened, you may well be asking? Well, the band continued to perform in and around Toronto (tearing the ceiling -- LITERALLY -- off the even-then-pretty-legendary Beverly Tavern that October, and later sharing an historic stage farther up Queen Street West with ultra-kindred spirits Pere Ubu), while several other with-it zines continued to sing the band's praises high and very wide ("Canada's last great hope!" opined no less than Flipside). But I suppose it was all a classic case of quite too little and somewhat too late; after all, the band had been beating their guitars against the wall for nigh on eight long years already. So as the Seventies unceremoniously limped into the Reagan decade, this particular Saucer shot no closer towards what should have been at least undeniable and everlasting international cult status. Nevertheless, THIS here tall rock tale has a most happy ending you see, as Edgar continues creating and even performing to this day, remaining, I am SO pleased to report, every inch the round hole against the music industry's multitude of square pegs he was that afternoon all those years ago when John and I first dropped by his Ferguson Avenue Village Green. Plus Pig Record 1 has now even entered the digital age as Bonus Tracks tagging the Sonic Unyon Recording Company's gala re-issue of Simply Saucer's remaining period audio (said collection, originally unleashed circa 1989 on vintage Mole label vinyl, immediately became hailed as "the best Canadian LP ever" over at Forced Exposure). Of course this deluxe Cyborgs Revisited disc is, to say the very very least, Required Listening, as lifelong fans the likes of Byron Coley, Thurston Moore, not to mention original "She's A Dog" howlers Steve Wynn and Cub Koda would most happily join me in telling you all right here, right now. So if you haven't already, stop by www.sonicunyon.com and get your very own without further delay, okay? 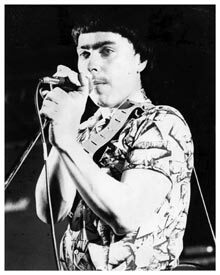 Godspeed then, Edgar Breau and Saucers everywhere, and long may you share your nice noise with us all.